Botox, Dysport, Xeomin, and other neuromodulators (neurotoxins) are prescription strength medicines that minimize the appearance of wrinkles. Injected into the muscles that lead to persistent lines on the forehead, between the eyes, and around the mouth, neuromodulators such as BOTOX® Cosmetic, Dysport® and Xeomin® temporarily diminish the visual effect of age, creating a more youthful, vibrant appearance in men and women. Contact us to determine which product is best suited for you. Revanesse Versa is a multi-purpose dermal filler leveraging state of the art production methods, optimal ingredients, and rigorous quality testing to provide remarkable results. With millions of syringes used worldwide since 2002, this FDA approved filler is designed for consumers seeking to control signs of aging. Founded in 2002, Prollenium Medical Technologies is a Canadian company developing cutting-edge products. With a focus in aesthetics, their products reflect a thorough understanding of real-world applications. Who is best suited for for Versa? If you are in the market for a more affordable filler option in the Denver area, Versa is your solution! This innovative product is recommended for both men and women looking to smooth facial wrinkles and folds and restore youthful volume. What can I expect following injections? Much like Juvederm and other HA fillers, post injection you may experience slight swelling, tenderness, bruising, firmness, lumps/bumps, redness, pain, discoloration, and itching to the injection site. This should subside within a day or so. In a 2017 study another popular (HA) dermal filler was shown to produce swelling 24% more often than Versa. The lower rate of swelling means many patients are able to get back to their lives almost immediately after the treatment. How are the lasting benefits of Revanesse Versa? Full cheeks are a key marker of youth. Age-related volume loss can cause the face to lose definition, balance and change shape, all of which can make a person appear older than their years. The mid-face is one of the first areas to show the signs of aging – as we lose facial volume, cheeks deflate and descend. When it comes to enhancing the chin and cheeks, a little volume goes a long way. Thin, tired skin can speak volumes about a person’s age. Signs of aging like sunken cheeks or a sagging chin can add years to a person’s face. These telltale signs of aging can now be addressed with Juvederm. Juvederm is comprised of hyaluronic acid (HA), a naturally occurring, key component of human skin. HA comprises 40% of the deep skin layer known as the dermis, and collagen comprises the majority of the remaining volume. HA acts as a firm gel-like matrix within which the collagen fibers and fibroblasts are embedded. It is chemically identical among species, and animal and bacterial sources may be safely injected into humans. HA fillers gained FDA approval as cosmetic dermal fillers in 2003 with the introduction of Restylane, and since then several other HA fillers have also gained FDA approval in the USA, including Restylane / Perlane (2003), Hyalaform (2004), Captique (2004), Juvederm (2006), Elevess (2008), Prevelle (2008), and Hydrelle (2009). Hyalaform is animal sourced, and derived from rooster combs, whereas Juvederm and Restylane are biosynthetic (non-animal) forms of Hyaluronic Acid (HA) produced from bacterial synthesis, harvested, and purified to yield medical grade HA. Captique, is a first-generation HA filler, in fact, it was the first HA filler to gain FDA approval, however, it is rarely used due to its relatively short lifespan. Radiesse is an injectable filler composed of calcium hydroxlapatite (CaHA) crystals suspended in a water-based carrier gel. CaHA is the primary inorganic constituent of tooth enamel and bone. and Radiesse is the synthetic analogue of the biologic compound. Hydroxylapatite has been used for years in a variety of applications, including bone augmentation, bladder sphincter augmentation, and vocal cord augmentation due to its biocompatibility, and received FDA approval as an injectable cosmetic facial filler in 2006. Radiesse augments facial volume via 2 modes of action: (1) as an immediate space-occupying filler, and (2) as a delayed collagen stimulating agent. Radiesse is used in all areas of the face except for the lips; it can be used for both deep facial volume in the cheeks, as well as superficial areas, such as the nasolabial folds and marionette lines. Radiesse is highly successful in the lower forehead & brow , nasal dorsum, cheek (malar), submalar, upper lip-cheek groove (nasolabial groove), lower lip-cheek groove (marionette line), labiomental crease, and prejowl sulcus. Long term studies indicate Radiesse lasts from one to one and half years. 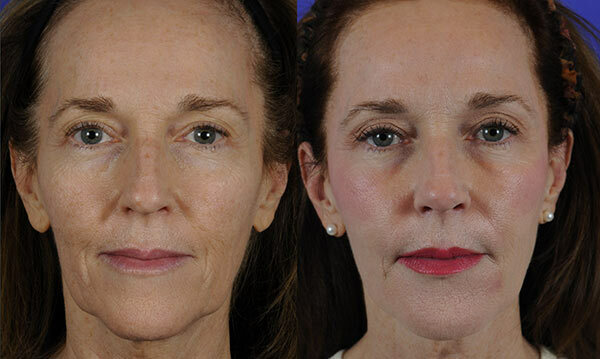 Radiesse lasts the longest when injected in areas unaffected by the facial muscles, e.g., deep injections adjacent to bone for deep facial revolumization. When using radiesse, one can expect bruising and a slight degree of swelling, similar to other injectable fillers. If injected too close to the surface, Radiesse can be visible through the surface as a white nodule. It is possible to remove the filler in such cases by massaging it back out through a small needle puncture directly into the offending nodule. Nodule formation is particularly problematic when Radiesse is injected into the lips, and its therefore not recommended for lip augmentation. Otherwise, Radiesse has a very safe risk profile. Sculptra is a biosynthetic filler contains poly-L-lactic acid suspended in a water-based delivery fluid. Initially approved by the FDA in 2004 for facial lipoatrophy, a medical condition resulting in aggressive fat loss in the cheeks and temples, Sculptra received FDA approval in 2007 as a cosmetic filler, reversing age-related facial volume loss. Polylactic acid acts by inducing a low-grade inflammatory response and stimulating fibroblasts to produce collagen in sites where it is injected. Initially, the aqueous carrier fluid will result in significant volume increase but this is quickly lost after a few days due to water resorption. Subsequently, the poly-lactic acid gradually stimulates collagen production and It takes approximately two months for the full effects of Sculptra to become evident. Volume will continue to increase for approximately four to six months. 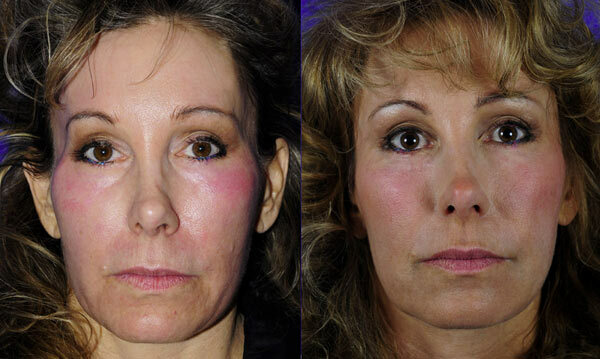 In most cases, the best results are obtained when Sculptra is injected in a series of two or three sessions. The improved volume lasts on average one and half to two years. Sculptra is best suited to restore deep facial volume in the cheeks, temple region, nasolabial folds, and marionette lines. It is best to inject Sculptra adjacent to the bone of the facial skeleton whenever possible. If this is not feasible, then it can be injected into the deep dermis or superficial subcutaneous layer. Sculptra seems to do best and last longer in areas where there is the least movement of the facial muscles acting on it. Sculptura is best used in the lower forehead & brow, temples, cheeks (deep malar), submalar, upper lip-cheek groove (nasolabial groove), and lower lip-cheek groove (marionette line). Sculptra can be expected to last, in most people, from one and half to two years. Please note that in certain individuals the duration may be reduced. Patients with severe volume loss, or in those with extensive scarring from prior surgery or trauma has taken place, as well as patients with HIV related lipoatrophy, tend to see shorter durations. Sculptra has a very safe profile in general. Immediately following Sculptra injections there can be some slight swelling or bruising. Patients receiving large amounts of Sculptra, patients with facial scarring, and those with thin skin may experience more bruising. However, in the vast majority of cases, there is essentially no down time, and any bruising can be easily covered over with make-up for a few days. Long-term complications are very uncommon as well. The most common long-term complaint with Sculptra involved subcutaneous nodule formation. This was much more common during its early use. Currently, however, new product-handling protocols, injection techniques, and post-injection massage, have led to a much lower incidence of nodule formation. Even if nodules do occur they generally resolve on their own, or can be treated with steroid injection to hasten their disappearance. Usually the nodules are only evident to the touch and cannot be detected visually. To minimize potential complications, be certain to work exclusively with people who are certified to inject Sculptra.